The MYW.AI™ initiative involves the creation, on Italian patent and design, of a Smart Speaker connected to a new generation independent blockchain network to certify, sell and distribute to managers and professionals in the Healthcare, Fintech and Industry 4.0 sectors, “edge intelligence” algorithms, safeguarding the levels of security and privacy required by the new GDPR guidelines. 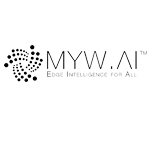 The MYW.AI™ initiative to date has been advanced by Knowhedge SRL, a Genoese start-up consultancy that has developed an innovative model of Open Innovation to help companies in the adoption of new technologies “exponential”, such as IoT, AI, Neural Networks, Edge Computing and DLT (Distributed Ledger Technologies, such as blockchain Ethereum and IOTA Tangle) to improve training, security and performance of their human resources in the scenarios of human-machine collaboration in the near future. The newco is expected to be registered as soon as the seed investor is selected for the final product engineering. Available both in a boxed version, to be inserted in the industrial edge servers, and in a desktop version, in an attractive pyramidal shape with illuminated spire to provide visual feedback to the user, the virtual assistant MYW.AI™ incorporates powerful AI and NLU (Natural Language Understanding) algorithms directly on local chips in order to optimize security and privacy of the interactions and restore that trusting relationship between man and machine at the base of a digital revolution4.0 that is increasingly successful for all the resources involved … human and not!